We often hear of artists who’ve painted grand paintings of churches, rivers or other natural scenery. We’ve also heard of painters who’ve done very realistic portraits. But do you know of anyone who’d paint something you use everyday – something really common and mundane – like a banana? Well, Andy Warhol was one such person! Andy Warhol was an American artist who literally found art in the small joys of daily life. He was American to the core, and most of his art include images of classic Americanism, like Hollywood. His work is said to have been instrumental in kick-starting the age of ‘Pop Art’; so much so that he is referred to as the ‘Pope of Pop’! He has worked on a variety of mediums, including print-making, photography, silk screening and more. Besides, his work penetrated all artistic arenas – music, films, sculptures and even books. Along with all this, he was a successful entrepreneur and had no qualms about making his art a business. Warhol had a very unique style and every piece of work carries that distinct ‘Warhol mark’. It’s just an indication of his colorful personality and how much he enjoyed his work. 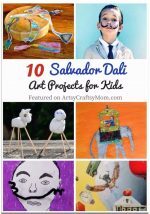 Since August is his birth month, we’ve decided to celebrate this quirky artist with some Warhol Projects for kids to try. This is going to be a fun ride! One of Warhol’s most iconic works is the one based on Campbell’s Soup cans. Apparently, this was what he had for lunch every single day! 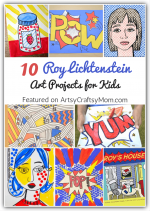 This project from Art Projects for Kids features a printable soup can label with just the brand name. Kids can think of their own flavor and color it in accordingly. Hand them clean, empty soup cans and put them together for your own Warhol display! Warhol loved using famous personalities in his work – Elvis Presley, Marilyn Monroe, Jackie Kennedy, Mick Jagger – and the Queens of England. His series of prints of Queen Elizabeth are particularly well known and use some unusual color combinations. Domestic Goddessque tries out a tissue paper collage of the same, and the result is quite unique! Warhol didn’t paint too many nature scenes, but one day he was inspired by a picture of hibiscus in a magazine and set to paint them. The result was a series of flower paintings using fluorescent colors. Another feature of these paintings was that they were all square and could be hung in any way. 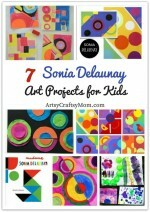 Kids can recreate this art with nothing more than a bell pepper and some paint – super easy! While Warhol’s work is certainly not among ordinary works of art, the painter himself was quite an interesting person! He nearly always wore black sunglasses and silver colored wigs – he had a drawer full of them! Wouldn’t it be fun to have a mini-Andy Warhol on your table? With this printable from Paper Toy, you can! The page is in French, so just translate it and follow the instructions. If you’d like to dress your kid as an artist for Halloween, then Andy Warhol is one of the easiest and most recognizable! Coolest Homemade Costumes shows you how to make a toddler Warhol costume with little more than an all black outfit, glasses and a bag that says ‘Campbell’s Soup’. Tip: For older kids, add a silver wig – makes all the difference! The fun part of doing an Andy Warhol project with kids is that there are so many options! The Crafty Classroom has some pre-printed art prints, which you can color in to make your own individualistic, yet Warhol-style series of prints. Channel Warhol and go bold with the colors, and don’t try to make them true to life! Andy Warhol’s nephew, James Warhola, was a famous children’s illustrator and he wrote and illustrated this book. James describes how visiting his uncle was something he looked forward to, and how the house was filled with all kids of art work and fun knick-knacks. 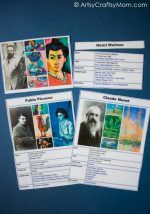 A great way for a kid (or an adult) to take a quick trip to the great artist’s home! Andy Warhol is known for his love for repetition, reflected in his daily lunch of the same soup and his art work which often features multiples of the same image. Another quirk was his cats – the story goes that he had about 25 or so of them and they were all named ‘Sam’! Art Projects for Kids shows us how to draw a sitting cat, based on the famous Warhol art called ‘Red Sam’. We know Warhol loved working on celebrities, and one of the most popular of those works is the Marilyn diptych. This is a silk screen painting featuring the same Marilyn Monroe image, each one in different colors. Turn your child into a celebrity by making your own version of the diptych, as shown by Meaningful Mama. Get multiples of a black and white photo of your child, hand her colored markers and let her go wild! The only condition should be that each picture should be different in some way. Warhol used several techniques in his art, and they were all equally stunning. Mini Monets and Mommies has a fun and easy foam try printing technique with which they create a series of prints in different colors, a la Warhol! 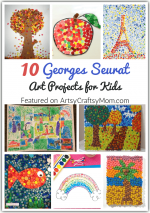 This is a great project for young kids, with some adult supervision. 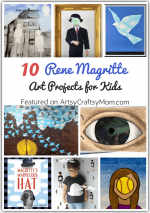 I’ve noticed you sharing some of my resources in the past (Cezanne for sure!) and I LOVE it! Thank you so much. Just thought your readers might be interested in this as well. Love your blog! Keep up the great work!